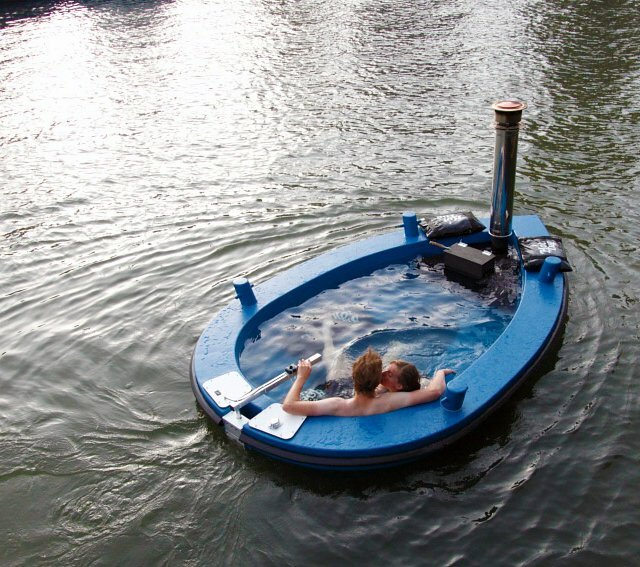 The Hot Tug Hot Tub Boat Is A Mouthful To Pronounce, Seems Fun | OhGizmo! By David Ponce on 10/02/12 • Leave a comment! At first glance it sure looks like your little boat is taking in water and is about to sink. The two people in the picture are just pretty darn cool about it. Then you look closer and realize that nothing of the sort is happening: they are happily soaking in a hot tub! It just happens that the tub is inside the boat. That, is the Hot Tug Hot Tub Boat (HTHTB) from the Netherlands. Containing up to 2,000L of water and propelled either by an integrated electric motor, or an outboard one, the HTHTB can fit up to 6 passengers looking to sit in water… while sitting in water. The H2O is heated through a wood stove and the contents can take around 3 hours to reach the desired temperature. No matter, since you’re likely to get one fantastic ride for your patience… and also for your money: prices range from €8,950 ($11,575USD) for a bare no-engine/no-heater hull to €16,450 ($21,260USD) for the fully equipped version.